So, growing my own lawn from seed; how difficult could it be? We’ve been extending our little orchard and some other parts of the garden into our back lot. The only problem has been a decidedly obvious dividing line between the rough, weed strewn Kikuyu grass on the former paddock side, and the slightly flatter, slightly less weed strewn Kikuyu on our original garden side. Plus, in the area where the fence used to run, vines and old post holes made things particularly messy. So the obvious way of forming it all into a single “space” was to dig out the lumps, fill in the holes and hollows, and cover the whole lot with a new layer of uniform grass. I had heard that growing a lawn from seed was particularly difficult, which was why almost everyone buys rolls of grass from a turf farm, and rolls them out like carpet. However, as seed is so much cheaper than ready-grown lawn, I figured I’d have a go with seed. If it was disastrous, I could always cover it with rolled out turf later. Well, the result wasn’t a complete disaster, but I can certainly see why most people go with the pre-grown stuff. Anyway, here’s a blow by blow account of my eleven week grass growing enterprise. I knew that you could get a thing called a turf cutter, and I figured this would be the best way to pull up the existing Kikuyu. I was keen to move the old grass further back into the lot, and use it to build up a mound for the later planting of a strip of native plants, which require good drainage. I had visions of simply rolling up long runs of lawn and wheel barrowing them away. A couple of days, max., I optimistically thought. 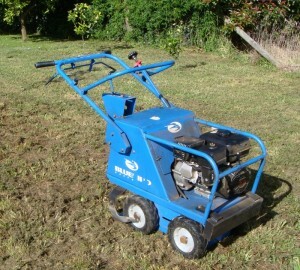 The Turf Cutter I hired to lift the old lawn. I hired the cutter from the helpful folk at MV Hire, figuring that 24 hours would be adequate. Sure enough the lifting of the lawn was quick enough, but the results were far from the perfect rolls of lawn I had envisaged. As the ground was uneven, and filled with all manner of grass types, weeds and occasional stones, it wasn’t possible to pick a depth that would suit them all. The cutter would lift small patches of growth, sail over others, and occasionally clog up or bog down, requiring reversing and having another go. Repeat runs would improve the results, but also raise clouds of dust, and cause the machine to catch on previously lifted material. So the net result was a few long strips of lawn (where the original grass had been in the best condition), but mostly patchy little bits of plant matter that had been ripped from the ground, and a fair bit of Kikuyu that was still clinging to the ground with its Herculean roots. If I’d had time to shovel out all the loose material, and then run the cutter over it all again, I think it would have got out a lot more, but that was going to take time, and I didn’t want to pay for additional rental. So after moving a few barrow loads of grass and dirt away, I gave up on that, and concentrated on running the cutter over the 160 square metres that I wanted to clear. The presence of fruit trees and fences was an added difficulty. Anyway, after waving good bye to the turf cutter, I spent the next week and a half shovelling the loosened turf into a barrow, and then digging out the grass and weeds that were still stubbornly holding onto the ground. Even so, I only had so much energy, and wanted to get the new seed planted before the weather got cold. I should say that I’d missed the opportunity to plant in spring, so I was planting in autumn, which is apparently the second best time of the year for lawn seed germination – not too hot or dry, not too cold or wet. So, I managed to dig up most of the Kikuyu, but I unfortunately decided that I’d be safe to leave some of it behind (after you’ve pulled up all the bits above earth level, I guess it’s inevitable that some of the tricky little roots will remain hidden below ground – well that was my excuse anyway). Adding to the negatives was the fact that a lot of weeds (such as dandelions) had decided that that was the week in which they were going to release their seeds to the winds, so there was a lot of seed competition floating in. Each day I’d clear a few barrow loads of grass and dirt, then replace it with a similar amount of lawn blend topsoil (somewhat sandy, but with plenty of mulchy content). I’d repeat this process until my muscles were failing me (not being particularly fit, most days would be 7 or 8 barrow loads out, and a similar number back in). Then I’d get my rake (one of those ones with metal teeth and a flat metal back), and flatten the whole lot out. Next would come the “lawn starter” fertiliser and the seed itself, spreading approximately a handful of each per square metre. I used Canturf‘s “Hardy Green” lawn seed. In a couple of shady areas (under the bigger citrus trees and near one boundary) I also put down some of their “Sunshade” blend seed. I’d then lightly rake over the whole lot, flattening it again, and slightly burying the seed. At this stage I believe I should have run a heavy roller over the dirt and the seed, but not wanting to wear the cost of hiring one of those too, I decided to do without (in hindsight, I think I would have got a better result by using a roller, but for the cost of delivery and hire, I don’t regret going without). I figured a good watering would settle the earth down, and a good watering was what I gave it (to be repeated daily for the next five weeks). Once all the old earth had gone, all the new topsoil had been flattened, and all the seed planted (or rather spread by hand, in a sprinkling salt type of manner) there was nothing to do but go out and water the ground – every day (standing at the edge and adjusting the nozzle to adequately cover the further away areas). Towards the end of the first week I became quite dispirited, as there was no sign of any growth, other than a few patches of what was obviously Kikuyu sprouting from the roots that has managed to evade the turf cutter and my shovel. I was hugely relieved about 8 days after I’d planted the first patch of seed, to realise that the fine shimmer of green I could see, was in fact a lot of tiny shoots starting to … shoot. There were also some weeds coming up, and thereafter every watering session was an opportunity to watch a race unfold. During the second week my concerns about the lawn diminished, as the shoots continued to multiply. The third week was full of apprehension that the weeds were growing faster than the grass. For the next few weeks, it was all just a mess of green (with a few patches of dirt, where inexplicably nothing had grown). Week 5 (for the first sections planted, and week 4 for the last section I got to), I had to neglect my watering duties, due to several days away. We were lucky to get a bit of rain in the middle of that week (or so the online weather site told me anyway), and on my return I was relieved to find that my adolescent lawn showed no sign that it had noticed my absence. Week six was a big step, where various things I’d read said I should give it its first mow. Setting the mower close to its highest level, I mowed the first couple of sections I’d planted. I was extremely happy to see that all the weeds that had raced ahead in the growing stakes, had now lost their heads, and with everything cut to a neat length, my new lawn was making up about 90% of the green that could be seen. 9% of the remainder was the indestructible Kikuyu, and only a very few weeds remained visible. Of interesting note; one of the most luscious sections of new grass was in the area where I had run out of the fancy new top soil, and had just pushed around some of the existing dirt. Week 9 was the second mowing, and I can confidently say that I now have a new lawn. It’s somewhat fresher looking, somewhat flatter, and considerably more uniform than its predecessor, although there are still a few major holdouts of Kikuyu. Next spring I intend to dig out some more Kikuyu, fill a couple of hollows that have remained, and plant more seed in these few areas. I think this is one of the greatest advantages of having planted my own lawn. From now on, whenever I dig up a tree or repair a section of damaged grass, I know precisely what seed I need to plant to match the surrounding lawn. It was relatively cheap, costing less than $700 in turf cutter hire, lawn seed, lawn starter fertiliser and 5 tonnes of lawn blend topsoil. I can use identical seed elsewhere, to give my lawn a uniform look. It was a great workout, and vastly more interesting than a gym. I feel a sense of achievement every time I look at that section of the lawn (even if others are unlikely to notice the difference). The results aren’t exactly fabulous. Still, they are quite good, and I’m holding out hope that as it matures, my fresh new grass will muscle out the weeds and remaining Kikuyu. It was a lot of work, and very time consuming. Not only the two weeks spent digging and seeding, but there was the following 5 to 6 weeks of daily watering duties. I did enjoy admiring my handiwork as I stood around each day, but it did rather cramp my schedule. Anyway, the upshot of all of this was that I am glad I had a go with the seed, and I am psyching myself up to do the same elsewhere around the garden when spring hits.